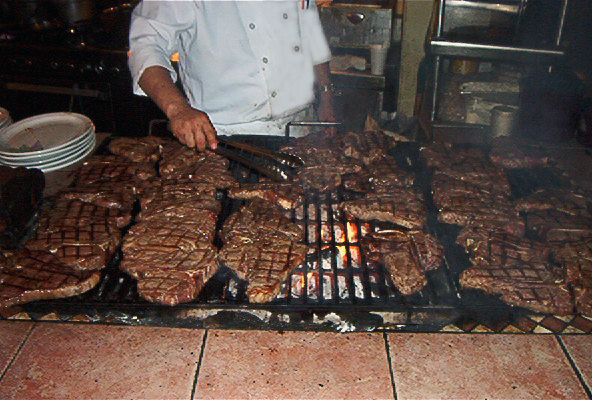 Bob Talor’s is an old school rustic steak house, in the north side of the valley. I remember when there was nothing out there but this place, but the city has grown right around it, you can see the 215 right from the parking lot these days. The parking for this restaurant is limited and you may end up parking on a gravel lot if you come when it is really busy. This is not a typical Las Vegas strip type steakhouse, the decor is old and hasn’t been updated in awhile, so if you are looking for a modern, updated & high-end place this is not it. They are definitely on the down home casual side. The nice part of the decor was that you can see the grill that they cook the steaks on upon entering, you walk right past this to be seated. The tables in the dining area are crammed together, which I think made it difficult for the waiters to serve the tables. Our waitress kept having to squeeze past on her tip toes to get to around. Because of this closeness I could’ve joined the conversation at the table right behind my chair if I wanted to. I pretty much heard every detail anyway. On the walls you will find what looks like old movie posters, black & white photos of all kinds and cowboy type memories. To me they didn’t seem to have an overall theme for the decor, just a mix match of western type items. Each of the entrees come with your choice of soup or salad to start. And then a choice of one of their potatoes, rice or mixed veggies with your meal. 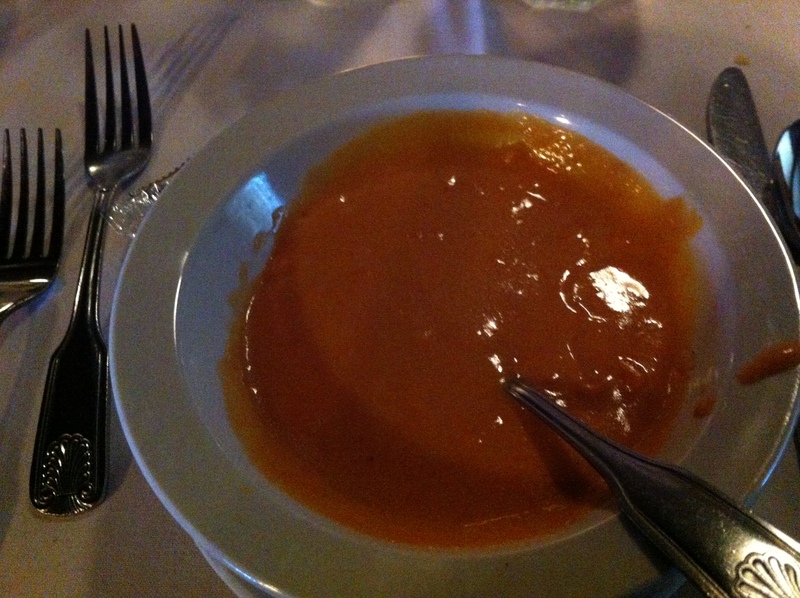 I went for the soup of lobster bisque which I was excited for since it had been awhile since I have had it. I apologize for the dark photo below – downside to a dark restaurant and cell phone camera. My opinion the soup was bad, it tasted like a canned condensed soup with no lobster pieces or flavor and had this vinegar sour taste to it. The consistency of the soup was gelatin like, almost as if they did not put enough cream into the mix while cooking. I took a couple bites hoping it would get better but it didn’t, it was very disappointing. On top of the bad flavor & consistency it was luke warm to cold, maybe this is why it was on the thicker gelatin consistency but if you are serving soup it should be hot. Why cut corners and not use the freshest possible ingredients that you can when you are charging roughly $30-50 a plate. The other disappointment of the dinner was the cheesy garlic bread that comes out, it was plain white bread topped with garlic flavoring and some kind of cheese. I found this to be almost stale and cold, it was hard to chew I had one piece and that was it, and I am bread person. 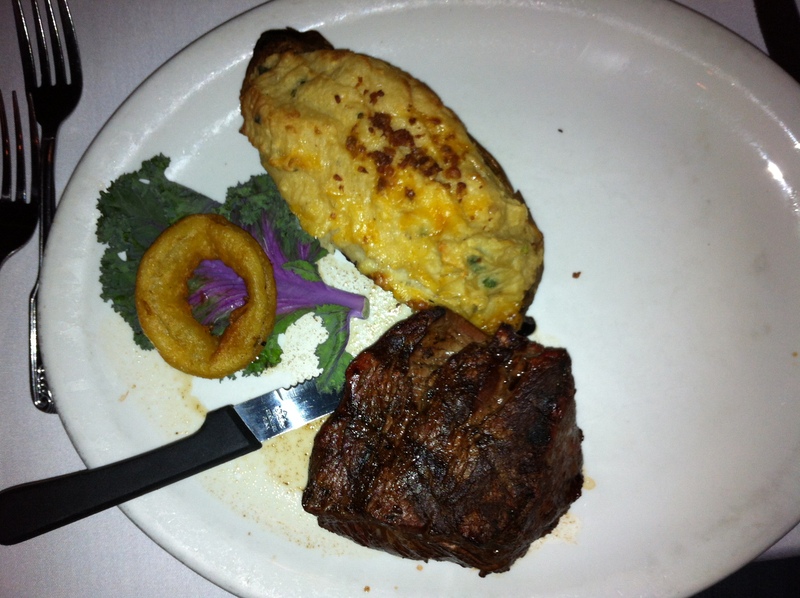 This is how my 12oz filet was delivered to me, it took up half the plate and the other half was empty, so if you are looking for presentation this is not the place to go. I ordered my steak medium-rare and got really rare, which meant it was undone in the middle and cold. I had to ask for them to take it back and cook it a bit more because I prefer my steak medium-rare, so the center is warmed through. When I did get my steak back it was still on the rare side but it was warmed through. My mother ordered her filet medium rare and it came out perfect. And my step-father’s ribeye came out a bit on the rare side but it was ok for him. So it seems they have a bit of inconsistency on cooking temps. It did have a nice beef flavor and was really juicy, you did not need any sauce to enjoy it. The seasoning on the outside tasted mainly of salt, it was not overly salty but I did not pick up any other flavors. The reason they are getting 3.5 stars is because their redeeming factor was their beef, it was juicy, tender and a nice cut of beef overall. I had the twice baked potato as my side and it was good, nothing that special, but as I left I realized I should have just gone with the baked potato because they really good as I passed them. And this is something I don’t thing the restaurant wants you to think when you leave, that you should’ve ordered something else. The only non-steak dish we ordered was one of their chicken entrees for my god-mother, Chicken Marsala they were nice enough to make it for her without any sauce, and she said that it was tender and juicy. I did not taste any of this but it looked and smelled really good. For the four of us to dine here and 3 of us had one cocktail each our total bill with tax was $150 before tip – so for approximately $38 a person; the dinner was just OK. I think if I was going to spend this money again I would go back to Ron’s Steak House this place is a little bit more per person, but the service, ambiance and food make up for the difference in price.